Spicy. Unexpected. Great partner for an Asian meal. Gewürztraminer is all that and more. A classic German and Alsatian wine, Gewürztraminer (pronounced ga-VERTZ-trah-mee-ner) is a full bodied wine that can be polarizing. There are those who are unfamiliar with it or prefer a more docile style of white wine. Others prefer its racy characteristics and great ability to pair with food. The wine is also produced in Washington, California and New York. It tends to do better in cool weather growing areas that allow the flavors to concentrate. My white wine journey took an atypical path – starting with German Riesling and not Chardonnay. As a result I experimented with German wines and regularly enjoyed Gewürztraminer before acquiring the taste for Chardonnay. If you are looking for a new white to expand your wine horizons, go with Gewurz! Gewurz means “spicy” in German and that is the main characteristic of this wine. Traminer identifies the wine as "coming from Tramin", a small city in south Austria where the grape originated. Gewurztraminer is the name of a grape but also the name of the wine made from the grape. In the Alsace region of France, the limestone and clay soil contribute to a full bodied and aromatic Gewürztraminer. About 29 million bottles are produced annually. 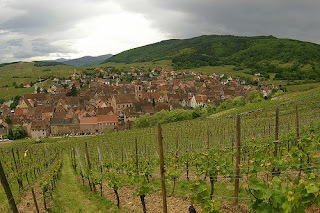 Trimbach is a very good Alsatian wine. The wine is delicious, fruity and with strong aromas, a very perfumed and flowery bouquet. Gerwurz can be sweet or dry, so you should be careful to check the label to properly match your palate. Alsatian Gewurztraminer is sweet and their Riesling is dry. In general, Gerwurztraminer should be drunk young, although finer examples can age up to 10 years. The wine is thick and rich. It pairs exceptionally well with Munster cheese, curry seasoned dishes, Chinese and Mexican cooking and other spiced dishes. Give it a try with barbeque or chicken wings. Sweet Gewurztraminer can even be served as a dessert wine. It should be served chilled to about 50 degrees. This is a wine that delights the nose. It has floral aromas (including rose) and that of grapefruit, apricot, mineral and pear. Gewurztraminer will never be recognized as a subtle wine, which is one reason that it pairs especially well with spicy foods that overwhelm more restrained offerings. It pairs well with rich, fatty dishes like pork and goose, as well as with ripe cherries. It also works well with otherwise hard-to-pair spicy cuisines like Indian and Chinese food, thanks to its strongly aromatic flavor. During a recent tasting at Corks, fellow tasters were purchasing a bottle of 2001 Hugel late harvest Gerwurztraminer. We hope to get a report, since this was a prize bottle. The late harvest bottlings offer great balance between sweetness and acidity. A nice starting point is a Gerwurz from Chateau Ste. Michelle or Columbia Crest in Washington. In the Finger Lakes, Prejean makes a great Gerwurz. The previously mentioned Trimbach is also a can't miss bottle. We opened up the '01 Hugel Vendage Tardive Gewurz at the French tasting this week. Absolutely stunning! Mike - sounds like a great tasting! I'll have to check out that bottle. Just got an update from two readers who tasted the 2001 Hugel Gerwurz. In part they said, "It starts out with a nose like a regular ice wine of say, a Riesling. It's very sweet, as a late harvest usually is, but finishes very clean. I get peach on the palette before the taste disappears. There is hardly any aftertaste. You don't get any of the usual spice from a Gewurz." In all, I understand it was a nice bottle, but perhaps not exceptional.